Pupils from our sixth class recently attended their Confirmation Enrolment Ceremony in Our Lady of the Wayside chapel in Jenkinstown. That have chosen their confirmation names and are focusing on learning the Gifts of the Holy Spirit at the moment. 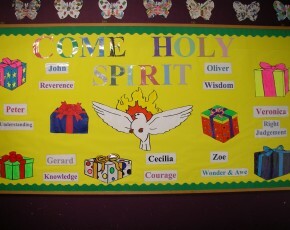 To help themselves remember the gifts that have created this wonderful display in their classroom.